The event is attended by all of the nominees who traditionally pose for a group photo ahead of the star-studded award ceremony on March 4. Film director and photographer JR, whose real name has been never made public, took a cardboard figure of his collaborator along to the lunch in her absence. Varda is nominated for the best documentary feature prize for her film Faces Places. 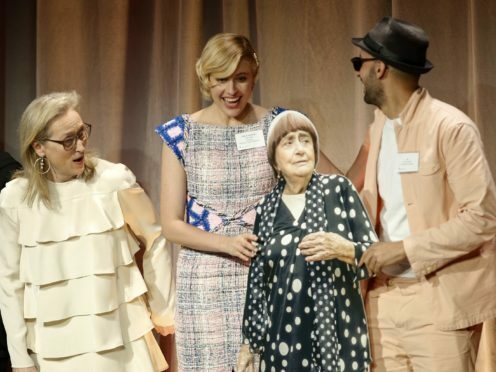 JR took the cut-out of Varda along for the annual class photo, where she was positioned next to Greta Gerwig, who is nominated for her directorial debut Lady Bird, and Meryl Streep, who is nominated for her performance in The Post. They were joined for the picture by Gerwig’s leading lady, Saoirse Ronan, who is nominated alongside Streep, and their fellow contenders Margot Robbie, Sally Hawkins and Frances McDormand. Allison Janney, who is nominated for best supporting actress for her role opposite Robbie in I, Tonya, seized the opportunity to embrace basketball star Kobe Bryant, who is nominated in the best animated short film category for Dear Basketball. All Oscar nominees are invited for the annual luncheon, which takes place a month before the ceremony at the Beverly Hilton Hotel. The class photo includes the actors, actresses and directors nominated alongside make-up artists, cinematographers, short filmmakers and editors. The Oscars will be handed out at the Dolby Theatre on March 4.